GreenThumb was initiated in response to the city’s financial crisis of the 1970s, which resulted in the abandonment of public and private land. The majority of GreenThumb gardens were derelict vacant lots renovated by volunteers. These community gardens, now managed by neighborhood residents, provide important green space, thus improving air quality, bio–diversity, and the well–being of residents. 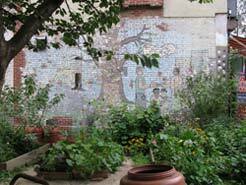 But gardens aren’t just pretty spaces; they’re also important community resources. GreenThumb provides programming and material support to over 550 community gardens in New York City. Workshops, which are the access point for supplies, are held every month of the year, covering gardening basics to more advanced farming and community organizing topics. GreenThumb gardens are located in all five boroughs in the city. Some are green spaces meant for relaxation and as a community meeting space, others are full–fledged farms, and many are a mix of the types. The volunteer gardeners are the backbone of our program and are of diverse ages and backgrounds.